In exploring the creative process in my life, and then in a therapeutic relationship, I realized that the two processes truly mirrored one another. I began by tracing my own experiences with art materials from a young age and through different stages such as high school, undergraduate art school, after college, and in my current stage of life. I then thought about my experiences so far in working with clients at my internship at Housing Works, and the different stages of the relationship as time evolves. On another level I have experienced and continue to experience both processes of art making as well as being a client, since I am a painter, and also have been in therapy myself for a number of years. 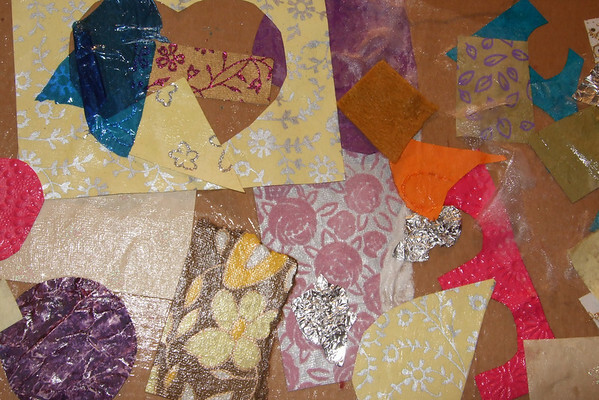 I am also inhabiting the role of art therapy intern – doing individual and group art therapy with my clients. I come from a painting background and tend to describe my own creative process in terms of painting, but when I speak about creativity here, I mean it to refer to any type of artistic expression – including music, dance, drama, writing, and other forms of creating. I began to see the artist’s and the client’s journey as taking different forms and phases throughout life. I feel that the two creative processes share remarkable similarities. To make it easier to explore I divided the continuous journey into different phases that were inspired by my own experiences so far relating to my artistic evolution as well as my overall growth as a human being so far. These creative phases are described here. As a child I’m sure that my art materials were fairly limited and might have included things like crayons, paper, (and maybe markers when I had shown a little restraint in handling the crayons). As I got older my material vocabulary expanded and came to include many more materials like paint, clay, textured pastes, and various surfaces. As I became familiar with each material it would open up the option to explore even more materials. With my new clients we have to begin by building on a foundation of trust and empathy before deeper therapeutic work can take place. It can take a few days to start to build a foundation, or even years as we often hear from therapists regarding their ongoing work with a client. I see this stage as beginning as soon as I was able to begin to manipulate materials – whether it was banging pots and pans together as a toddler, or scribbling on paper with crayons. At a young age, almost any surface and material becomes a possible noise maker or artistic creation – even surfaces that parents would rather keep “un-artistic” ! 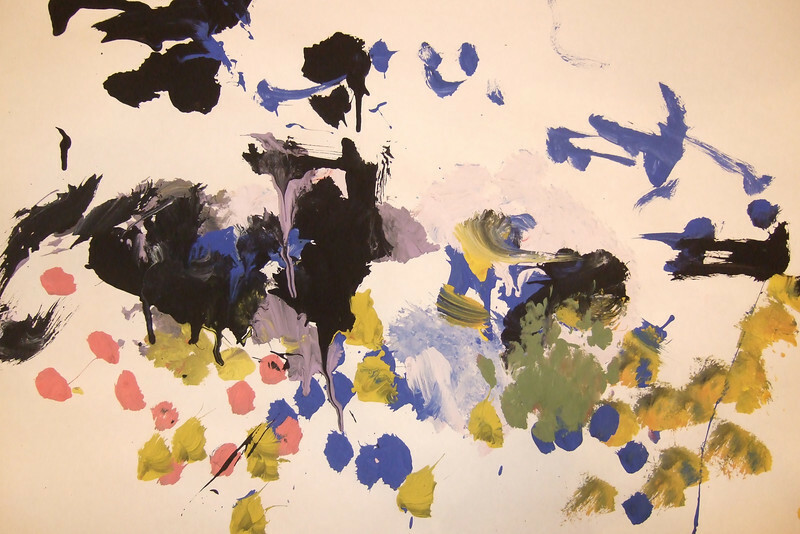 In art therapy, once a basic foundation of trust has been created between client and therapist, the exploration can begin. It might begin tentatively as the client begins to take small creative risks. Over time the experimentation with forms or feelings may expand. Perhaps in the beginning the client will only feel comfortable using materials such a pencil and pen – materials that allow the person to feel relatively in control. Perhaps color is out of the question, until the client begins to feel a basic sense of security within the therapeutic setting. 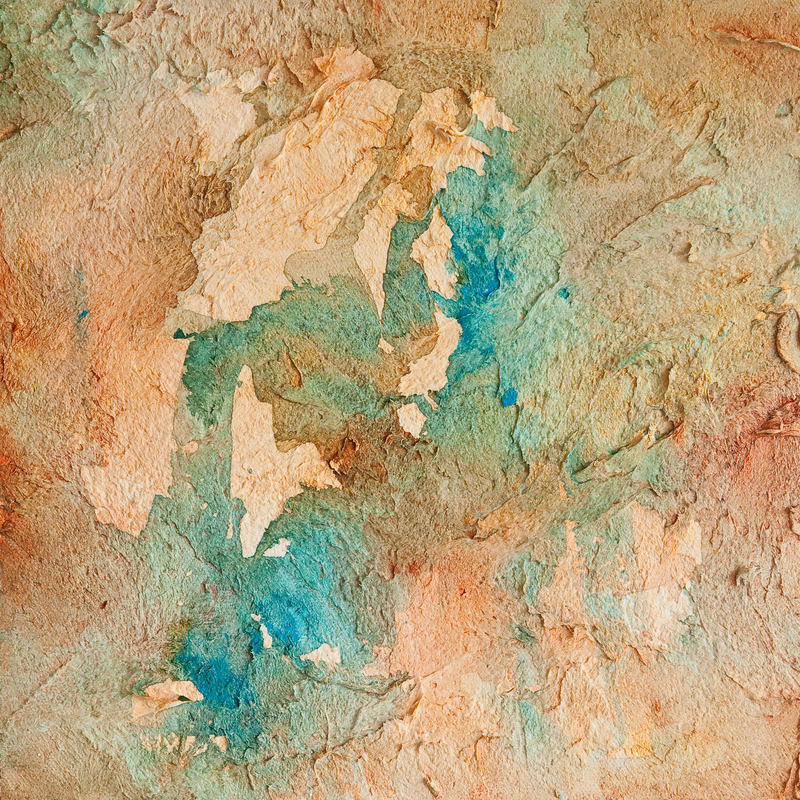 As time progresses, the art therapist and client will ideally expand the exploration of new materials and techniques. By the time I was in high school and creating art, my knowledge of art materials and various techniques, theories, and other artists had greatly expanded. I began to create work that was directly inspired by certain famous artists that I resonated with at the moment. My work in high school was extremely eclectic as my interests in the art world were constantly shifting and changing shape as I learned more and studied different artists. One week I was doing pencil drawings, the next pen and ink, and then the week after that, trying out oil paints for the first time. 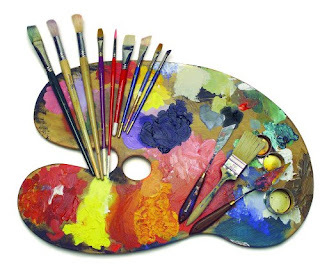 Some clients come to therapy with an art background and others do not, but either way I have found that as the sessions unfold most clients will begin to incorporate newer and unfamiliar materials into their repertoire if given the possibility. Exploration of materials can cause a client to feel anxiety, excitement, or often a mixture of both feelings. 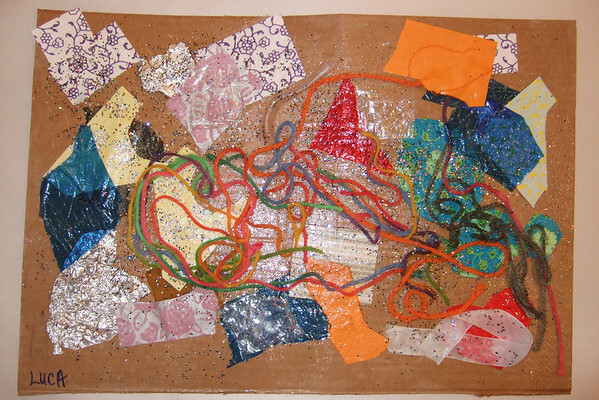 Over time and especially starting in college, I began to develop a stronger pull to certain materials over others – particularly acrylic paint and mixed media such as texture pastes and collaged materials. Although I love to experiment with other materials, these are the ones that have fascinated me and resonated with me the most over the last number of years. Similarly, in the relationship between therapist and client, certain approaches may start to emerge that prove more effective than others. This could take the form of different theoretical approaches that the therapist utilizes, or simply small routines that begin or end each session. 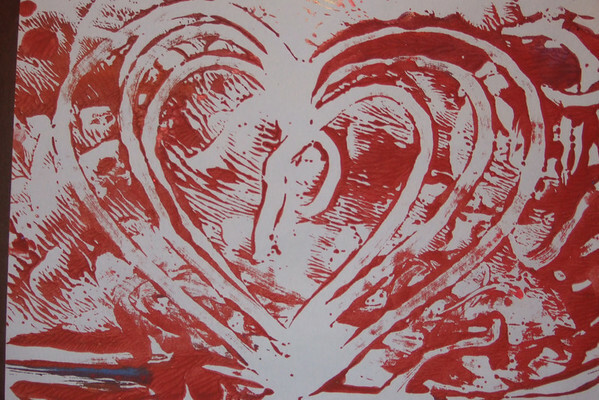 An art therapy client will usually be drawn to certain materials and techniques over others. Some of my current clients work almost exclusively in pen and ink on paper, while others work week after week with acrylic paint on canvas. Each client feels a certain resonance with certain materials, whether it is a conscious or an unconscious one. The client’s choice of materials will often change to reflect his or her changing mental and emotional stage. 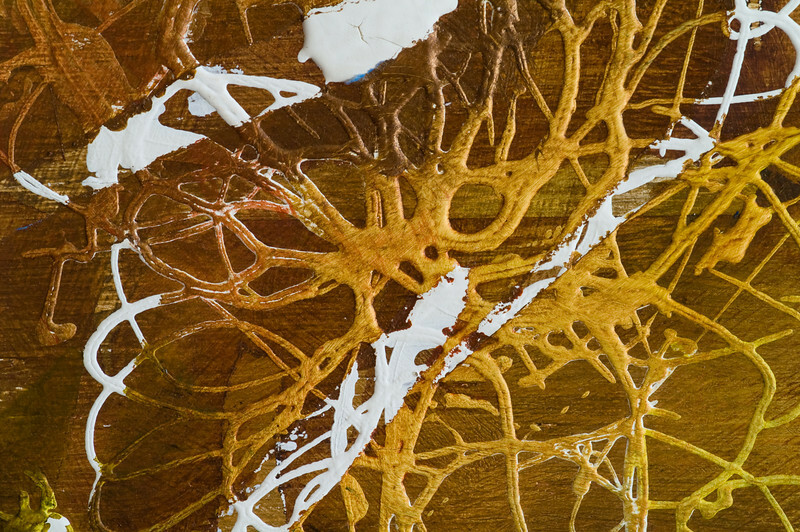 Finding a certain resonance with materials in the case of the artist, or with methods in the therapeutic relationship allows both to gain greater coherence creatively and therapeutically. After this has started to happen, certain imagery and symbols in the studio begin to emerge fairly reliably despite the varied number of pieces. Similarly, with therapy the therapist and client will begin to see patterns emerging in the themes that are explored. They will keep emerging even if one or both people are not directly addressing them. It is up to the artist or the client to hold each new symbol or theme up to their own light and decide whether it will be integrated into their sense of self, set aside for later, or discarded all together. An artist’s body of work will continue to evolve for as long as the artist keeps creating in life. Similarly, even after a client has stopped seeing a particular therapist, the dialogue that was started in the therapeutic relationship will ideally be carried out of the therapist’s “office” and out into the world. The dialogue will change forms and evolve within the context of old and new relationships as the client has new experiences. This is yet another aspect that creating for the artist and the art of therapy have in common. Neither one is black and white, especially in the fact that both are ongoing. An artist may complete a specific painting, but then it is onto the next piece and the next. Each piece consciously or subconsciously informs the next in some way. Similarly, the experience of therapy itself ideally expands outwards into widening circles within the client’s life. I often come across quotes by different artists that inspire me in my own work. I thought it would be nice to share a different one every once in a while! I wanted to share a few more pictures of art projects from the past few weeks that my students have been creating. I mentioned the Van Gogh inspired finger paintings that we had done recently. The children loved manipulating the thick acrylic paint and I showed them how to “draw” with their fingers, by scraping away some of the layers of paint in different shapes and patterns. A couple of their pieces are on the right. In some classes we created monoprints (like the one on the left), just by rubbing a second piece of paper over their original painting. 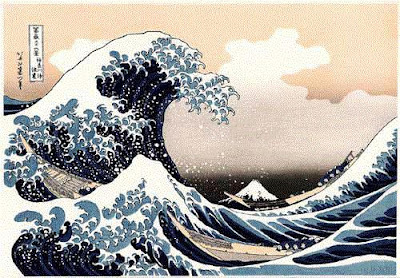 The children were able to see their unique paintings recreated in a second form, which delighted many of them. I have been teaching art to children part time for the past few months and am greatly enjoying it! My kids are very young – from 1.5 years old up to around 4 years old. 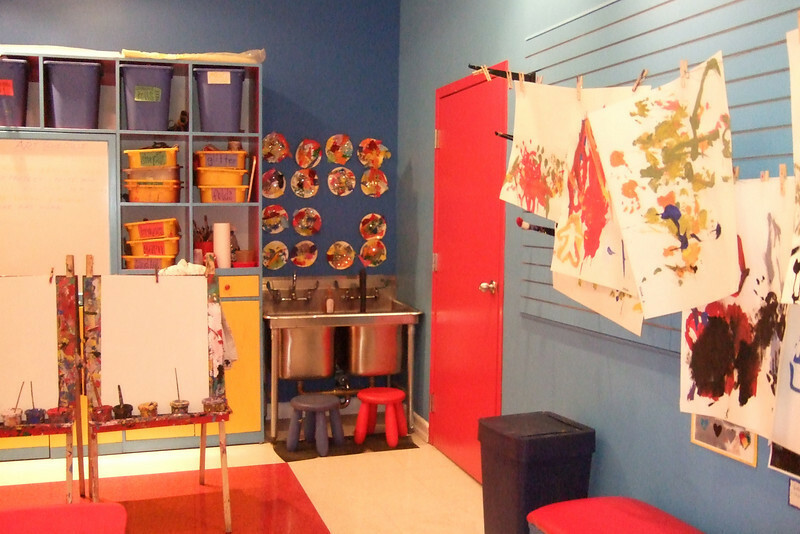 Since the children are so young, in many ways, it’s less about teaching art, and more about guiding the children through the exploration of art materials…textures, colors, shapes, and feelings. The theme for this semester’s classes is “famous artists” and so we have been exploring the work of artists like Matisse, Monet, Pollock, & Van Gogh each week. Each class explores a different artist and the techniques & themes that are unique to his/her work. 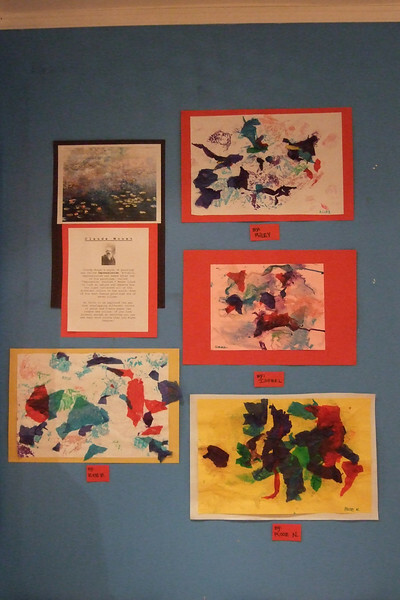 Monet (right) ~ After looking at pictures of some of Monet’s water lily paintings, we applied colorful torn tissue paper and a glue paste on construction paper. When the tissue paper was wet, the children noticed that the different colors bled together to create new colors in addition to the colors created by the overlapping paper. I explained that Monet had created his pieces by layering many different colors of paint in a similar way, to create pictures rich in depth & light. Pollock (below) ~ A few weeks ago we talked about Jackson Pollock and his famous drip paintings. I handed out colorful construction paper and bowls of liquid glue. 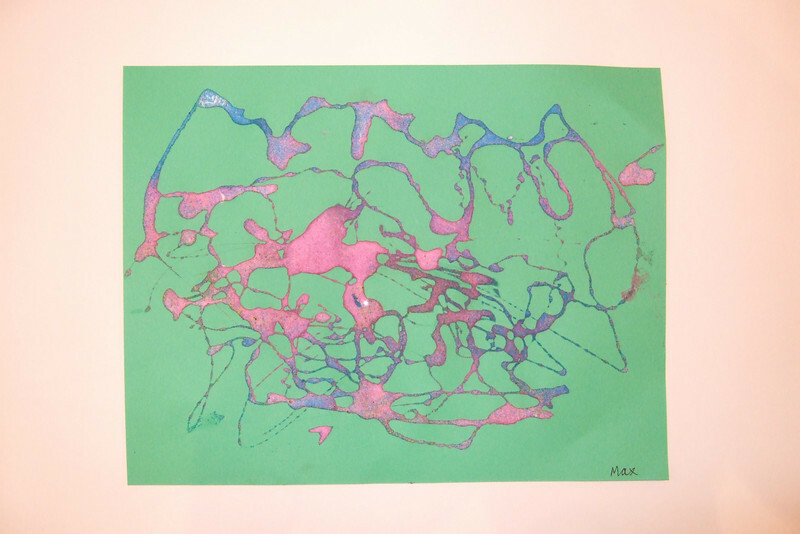 I showed the children how to dip a spoon in the glue and then dribble it all over the paper – creating different abstract lines, shapes, and both thick and thin lines. After applying the glue I presented them with containers of different brightly colored sand which they sprinkled over the glue. After shaking off the excess sand, they were left with beautiful sand splatter art! Van Gogh (not pictured) ~ This week we are learning about Van Gogh and specifically looking at his painting “Starry Night.” In class we have been using finger paint and applying it thickly onto paper. Then, the children are using their fingers or other tools to carve into the texture and create patterns and images in the paint, as Van Gogh applied thick oil paint to canvas and then shaped it with his palette knife & brush. Each class begins with some free painting time at the easel. The children have many jars of paint to choose from and are encouraged to experiment with color mixing & mark making. I am always amazed at this process and how at ease the children seem to be at the easel – even the first time painters! I have noticed how much working with these “little artists” has inspired my own studio practice. 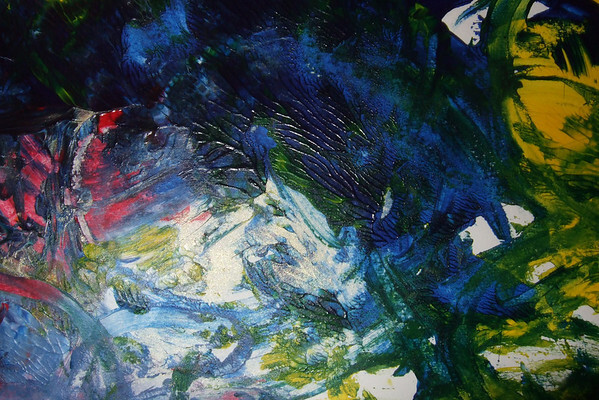 The children approach art making wholeheartedly and with such trust in the process. In fact, especially at this age, it is the process and not the product that truly matters. Similarly, with my own art making, the best studio sessions are when I am completely immersed in the process, and not overly preoccupied with the finished product. I’ve been working on a group of paintings that I’ve been calling the Earth Window Series. 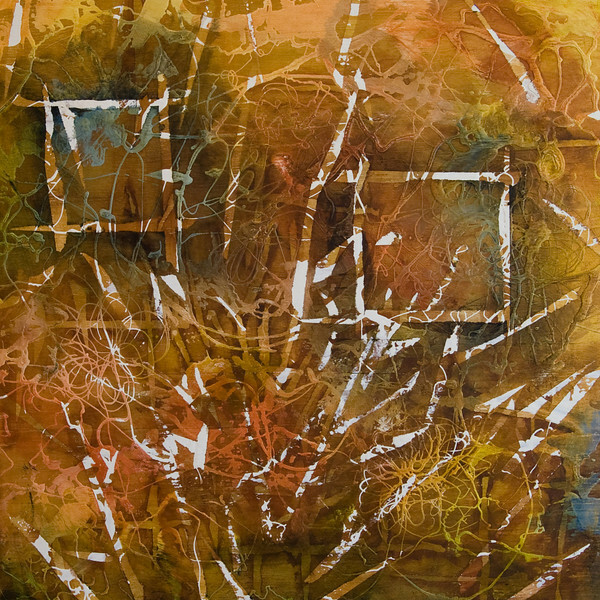 The paintings in this series have been taking on many different sizes, palettes, and textures, but they all share a common motif – which is the “window” or the usually squarish geometrical shapes that seem to be finding their way into them. The painting to the right is a newly finished piece from the series. The picture below shows this same piece at an earlier stage. 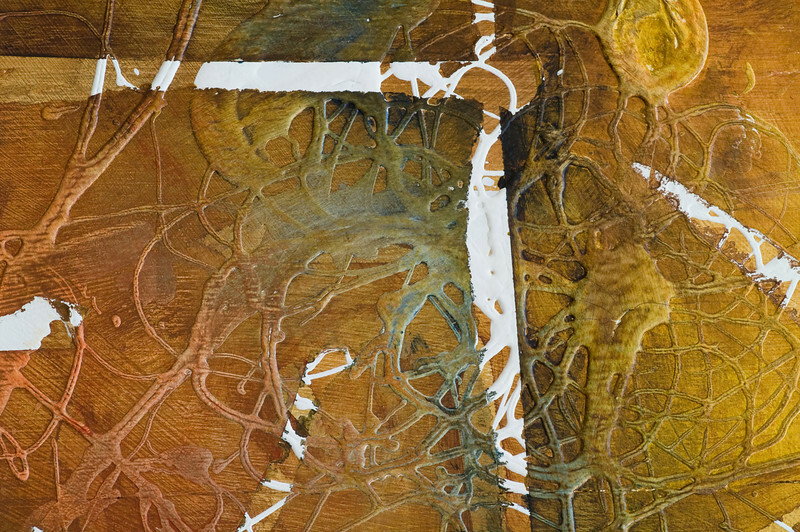 The very first layer of this piece (not shown here) was created by applying washes of bronze colored paint & earthy colors like burnt sienna & yellow oxide. Over that color layer I used blue painter’s tape to mask off different shapes. A slightly darker color was then painted over the tape, so that when the tape was removed the image beneath stood out. 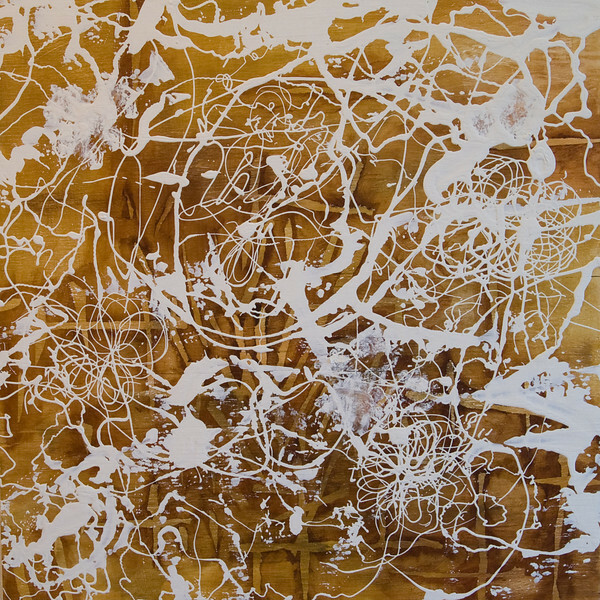 To create the white splatter lines I drizzled gesso (a surface primer) across the surface in both thick and thin line patterns. I truly enjoy the spontaneity of this process and have been exploring it in my newest paintings. 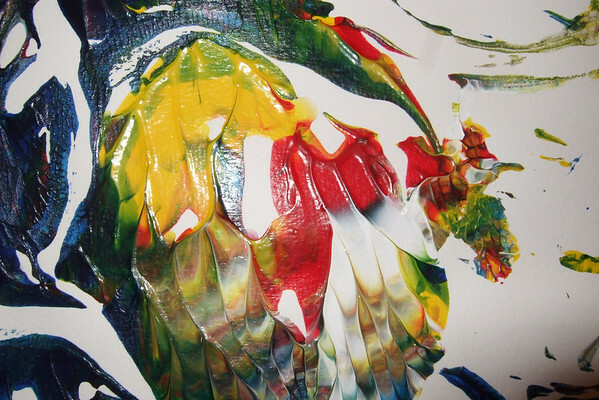 This technique borrows directly from action painters like Jackson Pollock (more on this in a later post). Briefly though, in action painting, the materials are applied to the surface in a very spontaneous manner, such as dripping, splashing, or smearing. Sometimes walking into the studio (even though it is only a few feet from my bedroom) seems to take immense courage. Sometimes that little space becomes a giant elephant in the room, seemingly overnight. It stares at me from across the hall and taunts me with its presence. I experience that conflicting pull to it that is balanced out by a desire to just shut the door and pretend it’s not there. Other times my studio is the one safe spot on earth and I practically run into it like an old friend, after a long day. I begin the process…turning on the warm lights, picking my music, and setting my materials out, basking in the immense satisfaction that this ritual brings.The hardest days are the ones where I struggle with the fear of approaching my own work. When I’m in “the zone” as some runners and artists refer to it, I feel exhilarated by the creative process and the world around me slowly starts to fade into the background as the painting process unfolds. Feeling stuck or in limbo is the exact opposite of that feeling though. At these times I either let myself walk away for a few days (and sometimes weeks!) or I push through and commit to just doing something – anything. Perhaps it’s just doodling in a sketchbook or flipping through images of artists that inspire me. We find so many reasons or distractions to keep us from creating, or at least to put it on hold for a while. Mine have included: draining day jobs, fear of being judged, poor time management, and even silly things like sorely needing to make a trip to the art store! Artists don’t get down to work until the pain of working is exceeded by the pain of not working. When I was younger my parents would often encourage me to “march down to my studio” when I had been in a melancholy or frustrated mood for a while. They knew back then what I had yet to figure out, which was that I am a very different person when I am cut off from the art making process. Without the outlet, feelings begin to pile up and eventually take their toll on my inward and outward reality. Now it is my wonderful fiance, Adam (a talented and creative soul) who will observe my mood and point me towards my studio. I might grudgingly trudge to it at first, but after a short time I can usually be found happily working away, with a grin on my face. As the authors write in Art & Fear: Those close to you know that making the work is essential to your well being. Vision, Uncertainty, and Knowledge of Materials are inevitabilities that all artists must acknowledge and learn from: vision is always ahead of execution, knowledge of materials is your contact with reality, and uncertainty is a virtue.